Iron Chef America is a television show in the Cooking genre starring Mark Dacascos, Alton Brown, and Kevin Brauch. The tv show first appeared on air on 2005-01-16. Our users found the overall impression of this television show to be Educational. 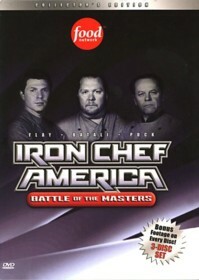 The tv show's official site can be found at www.foodnetwork.com/iron-chef-america. I agree with everything the reviewer above said, but I must also admit that I enjoy the original series slightly more than the American version. Marc Dacascos is the chairman of this version of the series and he does a great job (and is one of my favorite action movie actors as well :) ). He is much more serious than the original chairman, Takeshi Kaga, but also much more athletic, occasionally performing acrobatic moves off the stage. The iron chefs in this series are food network mainstays like Bobby Flay, Mario Batali, and Michael Symon. Most of them still take part in their own series on the channel as well. Finally, I would like to add that Alton Brown is an amazing host - he is extremely knowledgeable about so many things and his commentary is very enlightening (check out his show Good Eats if you get the chance, it is very educational and funny). Overall, I think if you enjoy cooking shows you should definitely check out this one, and catch the original series as well if you get the chance. Now this is a cooking show. It not only teaches you each week, but you get to watch a competition between rival top chefs as well. The basic premise of the show is for various top chefs in different fields to battle against one of 4 or 5 Iron Chefs. It is quite fun to watch and is very exciting. The host of the show Alton Brown is also very educational.